Update any room with the space-saving style of the DHP Dillan Chaise Lounge. This simply chic chaise lounge will make a lovely addition to your well-appointed contemporary home. Crafted with warmly finished wood legs and microfiber upholstery, this pretty chaise goes from seat to sleeper in a snap. The easy-to-use adjustment mechanism allows for multiple positions, including a sleeper, making it ideal for a catnap or for guests. Its clean lines and horizontally stitched accents give this piece a polished look perfect for any space. About Dorel Industries Founded in 1962, Dorel Industries is a family of over 26 brands, including bicycle brands Schwinn and Mongoose, baby lines Safety 1st and Quinny, as well as home furnishing brands Ameriwood and Altra Furniture. Their home furnishing division specializes in ready-to-assemble pieces, including futons, microwave stands, ladders, and more. Employing over 4,500 people in 17 countries and over four continents, Dorel is renowned for their product diversity and exceptionally strong commitment to quality. Dimensions: 61.5L x 30W x 29H in.. Neutral, tan microfiber upholstery. Tapered wood legs in a warm wood finish. Multi-position back with options for seat or sleeper. Contemporary design with unique horizontal stitching. Space-saving style. 350-lb. weight capacity. Some assembly required. 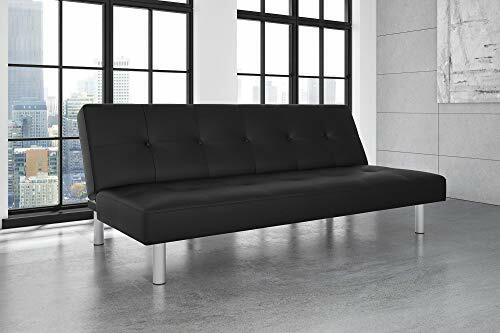 We have taken functionality to the next level with this Futon Sofa Bed with Armrest?by fusing entertainment, style and comfort into one multifunctional piece that is suited for any living style. 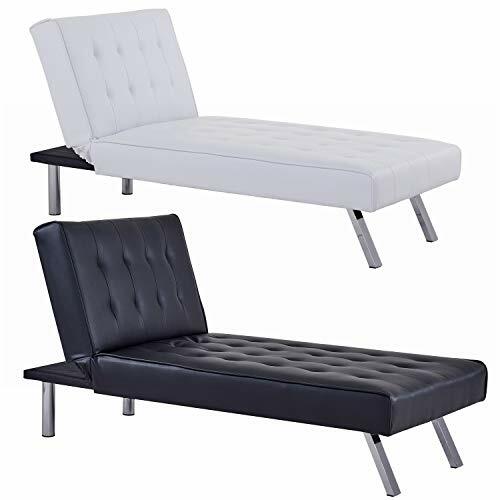 Our futon?s Modern-contemporary style compliments any home or studio. 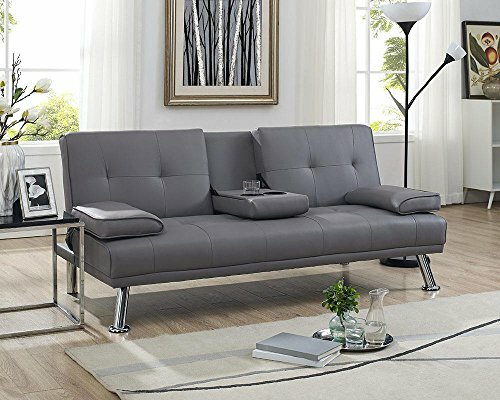 Crafted with durable tufted PU leather upholstery and 4 chrome-metal legs, this convertible futon has two cup holders, and conveniently converts into a sleeping bed. VERSATILITY ? 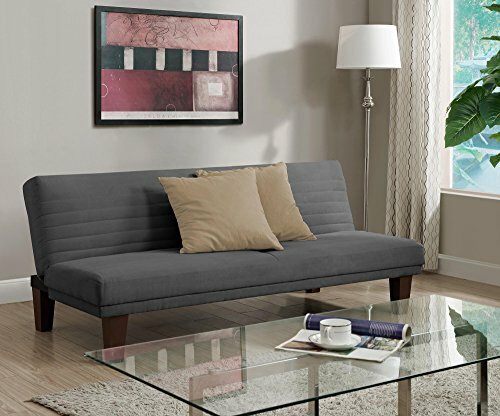 Perfect for small spaces, this futon is well suited for any apartment or studio. By removing the armrest, and reclining the back rest, this futon easily converts into a sleeping bed for guest. ERGONOMIC DESIGN ? Built with entertainment in mind, the middle arm rest folds down with 2 cup holders so you and a friend can kick back and enjoy a couple of beverages. The back rest easily reclines and can be converted into a sleeping bed. EASY ASSEMBLY - This futon comes with everything needed for assembly. The hidden compartment at its base stores the legs and hardware. With minimal parts, set up is a breeze! Mid-century style futon with sliptback reclining option. Available in 4 different colors Blue, Black, Dark Grey and Purple. Modern split back futon in soft velvet upholstery with scroll arms and gold nailhead trim. Features 6 dark wooden legs for extra support and give a mid-century modern look and feel. 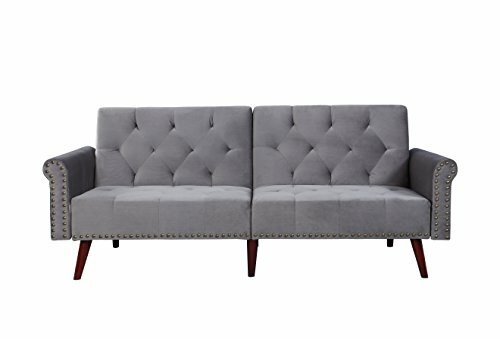 Dimensions: Overall - 70"w x 32"D x 34"H inches, Seat cushion: 70"W x 19"D inches, Back cushion heigh: 19" inches - Fully reclined depth: 41"W x 70"L inches. Designed to do justice to the room visually, the DHP Nola Tufted Futon adds seating and sleeper functionality to your home or office. 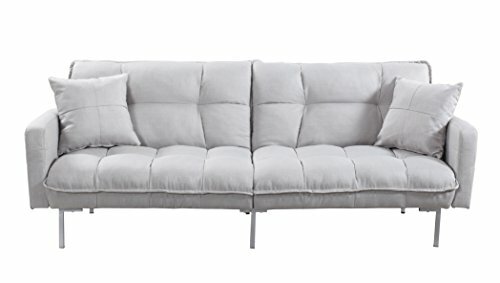 Clean button tufting uplifts the faux leather upholstery to create a purely contemporary appeal. Columnar silver-finished legs support an internal solid wood frame. Simply adjust the backrest to enjoy several lounging positions. Backrest offers multiple recline positions. Clean, contemporary styling. Wood internal frame with chromed legs. Faux leather upholstery in black. Tufting adds detail. Dimensions: 69L x 27.5W x 32.5H in..